Updated Program is now Available! Here is the latest version of this year’s program. Don’t forget to check it! Program and poster are now available! The academic program for the 30th Helsinki Summer Seminar is now available. Check it out! After some delay due to technical problems, registration is now available in “Application & Payment” section. Deadlines have been extended due to the slight delay. This year’s Summer Seminar will have a new thematic organization! Contrary to previous years, this time we will have five speakers talking about five different themes, one each day. We hope that this new organization will be more stimulating, as there will be more time for discussion and focused lectures. Another change is that this year speakers will debate with each other. Please note that we are having some troubles to make the electronic registration available, consequently deadlines will be extended. Welcome to the 30th Helsinki Summer Seminar on International Law! The rise of nationalism and populism in liberal democracies, the cold responses to humanitarian crises, as well as Brexit and Trump have hit hard against ideals and principles that international lawyers have long – maybe too long – taken for granted. Solidarity, humanitarianism, cooperation , trusteeship and responsible leadership are under attack. What will be the consequences? What is at stake, and for whom? Should international accommodate, or become a force of resistance? 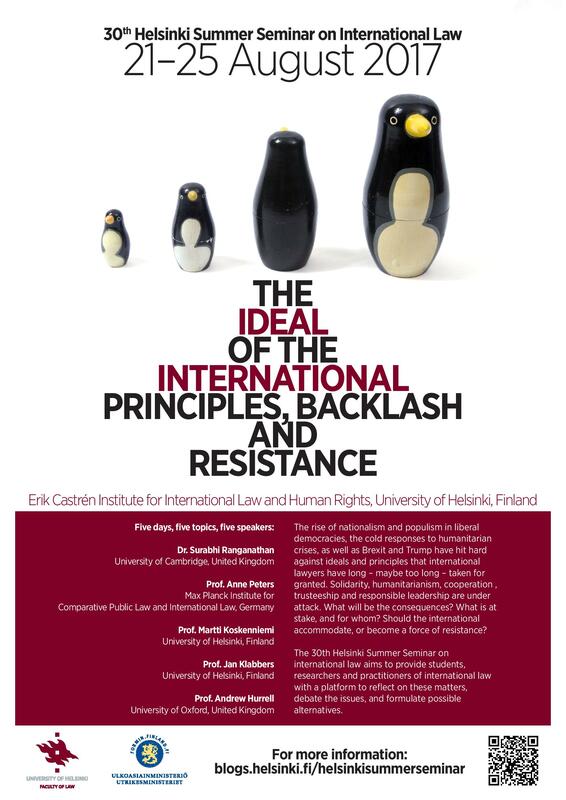 The 30th Helsinki Summer Seminar on international law aims to provide students, researchers and practitioners of international law with a platform to reflect on these matters, debate the issues, and formulate possible alternatives.